In September of 1847, Angie Garfield is growing up in the midst of guests and visitors at her father's busy tavern and inn, situated on the St. Charles Road into Chicago. Anticipating a Cotillion Dance to be held in the inn's second floor ballroom, Angie is focused on food, dancing and beautiful gowns. But when bounty hunters appear and a neighbor goes missing, Angie and her brothers realize that their friend Harry, a freed black man, may have been kidnapped. Mystery and intrigue ensue when the children and the community determine to find Harry. As Angie tries to help her family, troubles mount and there&#x2019;s no telling if she and her brothers will find their friend. Along the way, Angie becomes aware of how issues of the day such as anti-slavery and women&#x2019;s rights affect her personal life. As Angie struggles with these issues and her own responsibilities, she learns about what really matters. Ann Brack-Johnson grew up in Chicago and has always had a fascination with the early history of her city ever since her dad showed her the brass outlines of Fort Dearborn at Wacker and Michigan Avenues. When Ann moved to the Fox Valley in 1989, friends invited her to a Candlelight Celebration at Garfield Farm and Inn Museum. 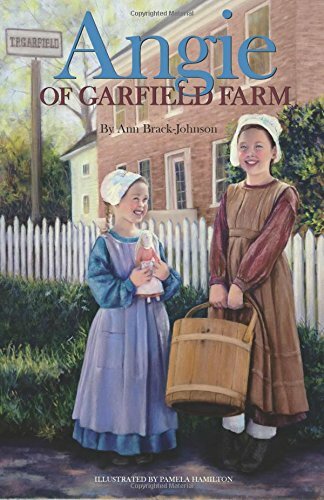 The historic site captured her imagination and her heart, and proved to be the inspiration for her story "Angie of Garfield Farm." She has been a Garfield volunteer since 1990. Professionally, Ann has been a freelance writer working for Chicago area publications. She holds a Masters in Journalism from Medill at Northwestern University and most recently has been working in telecommunications. "Angie of Garfield Farm" is her first published novel and reflects her passion for Garfield Farm and her interest in Chicago history. Ann and her husband Jerry Johnson live in Campton Hills, Illinois. Return/Refund Policy: Items are eligible for refund for 30 days after the order?s estimated delivery date. If you are dissatisfied with your purchase due to error on our part or if an item does not arrive within the estimated delivery time frame provided at the time an order is place, please contact our customer service team for immediate resolution. We will accept items for return if the item is no longer needed for 15 days of the items arrival date.